Study: ‘Arctic sea ice loss in the last 37 years is not due to humans alone.’ | Watts Up With That? Arctic sea ice in September 2017, when the ice reached its annual minimum. In addition, a yellow line marks the 30-year average minimum sea ice extent from 1981 through 2010. Image courtesy of NASA. Arctic sea ice loss in the last 37 years is not due to humans alone. New research by a Lawrence Livermore National Laboratory (LLNL) scientist and collaborators show that Arctic sea ice loss is enhanced by natural climate fluctuations such as El Niños and La Niñas. With manmade greenhouse gases on top of the natural climate variability, the decrease in sea ice is even more severe than climate models originally estimated. Using a series of climate models, the team used a “fingerprint” method to estimate the impact of natural climate variability. Natural swings in the Earth’s climate contribute to about 40 percent to 50 percent of the observed multi-decadal decline in Arctic sea ice. “Internal variability can enhance or mute changes in climate due to greenhouse gas emissions. In this case, internal variability has tended to enhance Arctic sea ice loss,” said Stephen Po-Chedley, an LLNL climate scientist and a co-author on a paper appearing in the Nov. 5 edition of Nature Geoscience. As it turns out, observations of sea ice loss were larger than models predicted. Sea ice loss since 1979 has increased due to natural variability; observations show more Arctic sea ice loss than the climate models average. “It is important to note that individual runs do show large changes in sea ice that are comparable to observed sea ice changes,” Po-Chedley said. “In these simulations, like in the real world, Arctic sea ice loss was enhanced by natural climate variability. According to NASA, the planet has been shedding sea ice at an average annual rate of 13,500 square miles (35,000 square kilometers) since 1979, the equivalent of losing an area of sea ice larger than the state of Maryland every year. Model simulations (or “runs”) exhibit a range of sea ice trends. Depending on the timing of natural fluctuations, individual model runs can exhibit greater or smaller-than-average loss. Similarly, both natural variability and greenhouse gas changes contribute to the observed sea ice loss. “This study helps to quantify the degree to which natural and anthropogenic factors contributed to Arctic sea ice loss over the last few decades,” Po-Chedley said. The team found that enhanced ridging over the Arctic Ocean promotes warming and moistening in the lower troposphere (the lowest layer of Earth’s atmosphere where nearly all weather conditions take place), which in turn, leads to accelerated sea ice loss. Arctic sea ice decline may be important to rainfall in California. Previous research has suggested that Arctic sea ice loss can exacerbate droughts over California. Other institutions contributing to the work include University of California, Santa Barbara, University of Washington, National Oceanic and Atmospheric Administration (NOAA) Climate Prediction Center, Princeton University and the Geophysical Fluid Dynamics Laboratory. The relative contribution and physical drivers of internal variability in recent Arctic sea ice loss remain open questions, leaving up for debate whether global climate models used for climate projection lack sufficient sensitivity in the Arctic to climate forcing. Here, through analysis of large ensembles of fully coupled climate model simulations with historical radiative forcing, we present an important internal mechanism arising from low-frequency Arctic atmospheric variability in models that can cause substantial summer sea ice melting in addition to that due to anthropogenic forcing. This simulated internal variability shows a strong similarity to the observed Arctic atmospheric change in the past 37 years. Through a fingerprint pattern matching method, we estimate that this internal variability contributes to about 40–50% of observed multi-decadal decline in Arctic sea ice. Our study also suggests that global climate models may not actually underestimate sea ice sensitivities in the Arctic, but have trouble fully replicating an observed linkage between the Arctic and lower latitudes in recent decades. Further improvements in simulating the observed Arctic–global linkage are thus necessary before the Arctic’s sensitivity to global warming in models can be quantified with confidence. ← Chicken Little of the Sea Is Dissolving the Sea Floor!!! Run Away!!! I don’t believe model ensembles when they say climate change is the fault of humans. I don’t believe model ensembles when they say climate change is NOT the fault of humans. I don’t believe model ensembles, period. They aren’t 100% wrong… just 95% wrong… LOL! Just because a couple of model outputs mimic the observed data doesn’t mean they are correct. Michael Mann gathered some data and applied some math to it and calls himself a scientist. Mere mimicry! Minah birds can talk. agreed , right for the wrong reason does not mean the model work or has nay worth for prediction. Being wrong does not really matter because even when models are wrong , they are kinda right. So once you take nature out of the model, all models are similar to nature?? There are so many things wrong with this ‘conclusion’ i really don’t know where to start. And they call this science?? The very fact that they have to run hundreds, if not thousands, of iterations on the many dozen computer models, before these climate modelers get an array of outputs that give them something they can believe in (from a preconceived supposition), shows that the models are not to be trusted and are NOT based on solid scientific principles. If they had ONE or TWO models that gave an similar outputs from different methods, both having define error bars and were checked against verified observations, then THAT maybe closer to science, and not as currently glorified computerized seances. these claims have been arrived at not through science but through models being fed the numbers to come up with a semi plausible excuse for the model runs that showed abject failure in predicting arctic sea ice melt rates. these people appear to have no shame and live in such an isolated bubble that they cannot see how stupid their claims look to any member of the public that has had even a cursory look at climate science and its various pronouncements over the years. Q: Which individual model in that rat’s nest do the observations track? A: None, not even within standard error bars. So 100% of the models are wrong. Here I am having a basic question [in the past I raised this on many occassions]: Is this trend associated with global warming alone or it also includes other components [as stated by IPCC] like ecological changes, a local/regional component. If it includes ecological changes, then the question is: are those models include this component of human induced changes [urnan-heat-island rural-cold-island effects]? Also, IPCC state that the global warming component starting year is 1951. In the above figure the starting year is 1985, will this be unbiased? That graph — or a similar one — should really emphasise the models which approximate to reality, with the best one given a distinctive colour and prominence. Then, in a note, the parameters of the best model should be printed alongside, with its assumed climate sensitivity to CO2 in huge big scary bold and loud letters. That might make things clearer. Most of them are 100% wrong. A few might be not wholly wrong. Did y’all know Greenland’s ice sheet is, “tragically”, melting? Who knew? There never was a time when it didn’t melt in summer. Tragic or not. 1. when they model hurricanes do you ignore the ensembles? 2. its never a question of to believe or not to believe. that’s NOT what models are for. In the past I had to run war models for the government. 1. These models ( an ensembles) are used to make decisions. 2. NO ONE not a single person mistakes these models for reality. 3. No one, not a single person, believes these models can predict with accuracy. 4. No one, not a single person, Believes in or disbelieves in the models. BUT, the models are used to guide, inform, shape, and limit decisions. And this is rational. so what can the models here do? well we cannot “run an experiment” with the arctic over again. we cannot repeat the last 40 years and hold warming constant to isolate the contribution of natural and anthropogenic forces. so therefore we dont know if its 100% anthro or 100% natural. 3. Use physical models ( instead of or in addition to stats models) to estimate the contribution. If you are happy with ignorance, you do 1. If you are afraid of making an error you do 1.
and never be wrong. This is the unimaginative “A” student approach to life. However, in science we usually do 2 or 3 or both 2 and 3 and caveat the understanding appropriately. Its not a case of believe or not believe. Its a case of what does the best evidence ( however limited) suggest. Now some folks fear being wrong, as if there is some kind of hell for estimating poorly. Luckily science is about being less wrong. Not right, but less wrong. Its a shame you don’t really understand Science or Maths Steven. I make a mathematical model of someone shooting a a sniper rifle at your head on a gusty day. half of the ensembles show you as dead, the other half as unscathed. depending on the wind. I conclude , using ‘climate science’ as my guide,that the most probable outcome is that you are half dead. Or perhaps just brain dead. Hey is that what happened? sheesh, even hurricane watchers understand that when there are wide variations on a model it shows that the outcome could go very different ways and the average is not worth the computer printout its printed on. Yup, most people keep an eye on the end of a 10 day model run for the trend, but only pay attention to the nearest 2 to 3 days for a forecast. Beyond 2 to 3 days they aren’t reliable and mislead. The basic problem with ‘climate models’ is you can’t usefully model, repeat or test actual multi-century climate change trends, at all, and won’t be able to for a very long time. So Mosh and Co want to pretend in the interim that weather cycles are really ‘climate changes’, rather than extraneous noise. “Straining at a gnat while swallowing a camel”, comes to mind. We have physical models of the earth and climate now? I’d like to see that! They were called “GAMES” for a reason. They were all FANTASY. Stick to low end advocacy, Mosher. Although you are pretty much a failure at that, too. You certainly seem to thrive on it. Can you define “right” and “wrong”, and “less wrong”? Its seems a bit pot of ‘sloppy-joe’ as far as definitions go because certain people do lobby to make economy-wrecking and impoverishing global policies and agreements, infrastructure investments and allocate vast sums of other people’s money based on such things. Can it be made a little more materiel than navel-fluff? Or is that being unreasonable? Its not a case of believe or not believe. Its a case of what does the best evidence ( however limited) suggest. Its also incredibly important to understand the limitations of models. When its pointed out that the error inherent in the calculation is much larger than the signal its trying to measure, do the modelers respond with a justification or counter argument? No. They know the models cant predict climate but their jobs depend on being allowed to improve them until they believe they can predict climate. But the current GCM paradigm is doomed to failure. And when was that exactly, that you did science? You ignore the salient point – anybody who uses a model that demonstrates no skill for anything is a fool. Using a model that is wrong for making any kind of decisions is just stupid. No matter how many 1,2,3 and the rest you produce. I use models that have some predictive accuracy and do not use those that don’t. Climate models fall into the latter compartment. It’s that simple. Yeah, and religion is a model used to guide, inform, shape, and limit decisions too. Mind sticking to science please? When hurricane models cluster around a single answer, we have a moderate amount of confidence that the hurricane will actually follow the track predicted. Because that was what we have seen in the past. When hurricane models are all over the map, we know that we have no ability to predict where they hurricane will be more than a few hours into the future. On the other hand, GCM models have never managed to cluster around a result that has then appeared in the real world. The reality is that GCMs all run hot. That is what they were designed to do from the git go. Models give scientists a STARTING point as to where to look for answers. Unfortunately, climate models have been used as the FINAL answer upon which all future actions are to be based. Everything you think you know about the world is a model ensemble, Willis. Glad to hear you don’t believe in any of it. Extreme skepticism, even about ones own idea of what the world consists of, is always wise. So the effect of insulin on the blood sugar level of the anesthetised rabbit I measured at university was actually a model ensemble? Weird, it looked like a rabbit. The mental models or paradigms that we use to navigate our daily existence are singular for each purpose. I don’t evaluate 20 different models of my driving and how it interacts and affects the drivers around me. I have one. If new information conflicts with that model I adjust that one, singular model and move on. The thing that Mosher ignores, willfully, is that his “war plane” models are subject to correction by data; climate models are impervious to correction, mostly due the the fact that the “physics” is largely parameterized input. Indeed. They’re worse than we thought. Willis — Thanks for getting in first with what is, I think, the key observation. The current climate models simply aren’t remotely credible. Perhaps someday, they will start making verifiable predictions. Or at least stop making wildly incorrect predictions like tropical troposphere warming. Or at the very least maybe they will provide some insight into phenomena of actual interest to reasonable people. e.g. Why did it stop raining in the Sahara 5000 or so years ago? For the moment they suffer from one major difficulty. They seem to be utterly useless. Our QA used to emphasise a computer model is only as good as the data it is based on. We have files like AMSRE_SSTAn_M which show the local variation in temperatures. It clearly shows that to get a tolerably accurate figure given the highly localised and erratically located hot spot sources you need conservatively a minimum of around 250 stations in the Arctic regions. As this file also shows hot spots as a source and our QA would have demanded that since the claim is for human cause of warming in the Arctic these hot spots should have the corresponding data on fossil fuel use in this area. I must say the scale and rapid rise of these of spots would require more a large number of nuclear explosion than burning fossil fuel to my mind. I cannot understand how any peer review at all could have been done given the ground level failures that are certainty third year grammar school science in my day let alone supposedly the work of top scientists. They are not 100% wrong … just 95% wrong … LOL! this is the cliffhanger that makes our daily climate challenge models so exciting. do not miss our daily doom show. Tomorrow same time same station. I think they could bother to list the other ocean cycles in the story. We can handle it. But that requires looking and comparing. Such things are not allowed in politics, the courts, and the media at the request of advocacy. It’s even more basic, for example, Steven Mosher (above) is an English Lit and Philosophy graduate who specializes in simulation. If Mosh had instead studied geological history, sedimentology and paleontology in particular and performed quite a bit of rock-hopping mapping-exploration and seen, described a lot of drill core through sediments he’d take the IPCC’s claims and publications with a grain of salt. And would probably exhibit an attitude not unlike David Middleton, because he’d then be firsthand and directly familiar with what constitutes climate changes on earth with time. He would then scoff at the nonsense he sees in ‘climate model’ runs, and their associated toilet-‘paper’ level claims, and resulting public policy recommends. He also would not be under the warped illusion that he can learn something or expound something about Earth’s climate, from ‘climate models’, as those are actually about 250 to 500 years premature to be making genuine scientific public-policy recommends, based on their output. But a philosopher with a simulator feels he’s developed a neo crystal-ball and can now old-school soothsay to those listening his miraculous insights and marvel at his masterful grasp of IPCC la-la-land speak. This is what occurs when observations and empiricism is not your cup if tea, and optional. Nice to have, but not necessary. And Stephen philosophically argued against it being necessary just a few comments up above. Neo-soothsaying crystal-ball gazing pseudo-climate-science don’t need no stanking observations and empiricism! Consequently actual empiricism and observations will have to debunk the neo soothsayer-philosopher’s and their wretched neo-crystal-ball, and see those phony’s off, too. When is the end of our current Holocene inter-glacial period expected ? Either right away or else in 30,000 years. Or maybe in between somewhere. It’s settled! Most geologists say within the next 2000 years. If the mainstream theory that summer solar insolation at the Arctic Circle is critical, then it should begin sometime during this millennium. However, Javier, who posts on this blog, prefers a theory from the 1970’s that the obliquity cycle is critical and concludes that it will commence in about 1500 years. In more recent developments, has anyone followed Valentina Zharkova’s address to the Global Warming Policy Institute? If I understand correctly, she concludes from her solar model that, beginning in 2020, Earth will be going back into Little Ice Age conditions for the next 350 to 400 years. If she is right, this is the beginning of the end of Climate Cultism, and I expect such conditions will also pose a serious test to the resilience of industrial civilization. And it will all have been big fossil fuels fault for pumping out masses of CO2 as predicted by climate change model run #1846789. Well I hope not, the Little Ice Age wasn’t that much fun. But if it does get colder, all those who advocated giving up fossil fuels and the like should be made to stick to their guns and go without. Oh and made to wear shorts all year round. And people wonder why Russia is out to increase its influence in the areas to the South? If there is a return to LIA conditions their crop yields will suffer and they’ll need more growing space. Greenland ice fluctuates with the solar cycle and El Nino. Compare the last solar peak with today (Francis (Jennifer), 2017). Maybe the ‘Arctic’ as crudely defined here follows a similar natural path. Ya think? You forgot about the AMO, Doc. It appears to be taking a negative temperature course of late. Another notable technicality is that we are still in a positive PDO phase, which permits El Nino conditions to be dominant. I’m excited to see whether SC24 is a short cycle, or if we are entering a lower minimum yet. Svensmark’s laboratory observations seem to be playing out in the skies over me (certainly a more observable phenomenon than CO2 warming), how about you? I wonder if the IPCC crew fears a coming cold period that will undermine their position hence the absurd recent forecast. I did not know about AMO. This could be what you are looking for. Let’s wait and see. I find it logical that during warm ocean cycles, the extra enthalpy in polar air will cause winter temperatures to be less frigid than if dry air persisted (as in the ’70’s) but also keep summer temperatures from exceeding normal. This has been observed. Another feature of the warm ocean-induced enthalpy is extra winter cloudcover (now enhanced by low solar/high GCR flux) which will always warm the pole, which receives almost no solar radiation during the solstice. It should be quite obvious to them without the blinders of “settled” science and consensus. Step one: Assume that all warming is caused by CO2. Step two: Discover that there are natural cycles that warm the planet. Step three: Add these natural cycles to the warming predicted by the models. Conclusion: Climate science is hopelessly broken. Conclusion: We need more money. Because the science is settled. Are these the same models that predicted an iceless summer by now? And half of the change is natural? “37 years ago?” Countless eons in the news cycle. The observation of increasing water temperatures from the equator which have been penetrating the Arctic over the last thirty years is a good predictor of decreasing ice. LLNL? Is it where our beloved Ben Santer works? Arctic sea ice summer minimum declined from 1979 until 2012. Antarctic sea ice summer minimum grew from 1979 until 2013. Antarctic winter maximum peaked in 2014. These facts alone indicate that rising CO2 is probably not the cause of falling Arctic sea ice extent. No, no, no John. CO2 is a warming gas and as we all know, warm gasses rise. So the CO2 is rising to the North Pole and therefore melting the sea ice. In the same way, CFCs are a heavy molecule and therefore drain to the South where they create the Ozone Hole. The science is settled, you just need to understand it. Let me think here a minute, if I can stand the pain. Sea ice predictions are correct if you add in a fudge factor called natural variability. In other words, the models aren’t correct. Now let’s look at global temperatures. If the models are correct then the models must also be including natural variability and logic dictates that any man made contribution to warming must be smaller than the total, i.e. “natural variability + man made = total”. Anything else and they are simply saying that the models are wrong and that warming will be worse than predicted (or is that projected)! Have I got this right? For what its worth, there are newspaper photos somewhere of a nuclear sub surfaced at the actual North Pole in the late 50’s with no ice in sight. Maybe nature doesn’t need much help from greenhouse gases in these calculations. There is. Just search “Ice at the North Pole 1958” and a WUWT article pops up with plenty of pics. While all the attention is focused on Arctic sea ice decline. What’s been getting overlooked is the increases in snow cover extent over the NH during the fall and to a lesser extent the winter. Since 1967 the NH snow cover extent during the fall has trended upwards by 1.5 million sq km and the winter extent by nearly 1 million sq km. l wonder how much of this increased snow cover extent is offsetting any warming effect that the decline in Arctic sea ice may have. over the course of a year reducing arctic sea ice cover doesn’t have a warming effect. exposed ocean within the arctic ends up cooler than had it been covered by ice. Yes it does appear that Arctic warming is having no effect on delaying the start of the winter season across the NH. We have had a recent example of that here in the UK. Even though the temps in the Arctic were well above average and sea ice cover low. My local area here in the UK still managed to have its 2nd most early recorded snow fall in 41 years on the 27th Oct.
Tony Heller has reported that the published Arctic Ice coverage records use a cherry-picked high point occurring in 1979. Shouldn’t this be cited? If it was, I’m sure Dr. Humlum would have done it. The satellite record started in 1979, not 1972. Useful satellite data concerning sea ice began in December 1972 with the Electrically Scanning Microwave Radiometer (ESMR) instrument. However, this was not directly comparable with the later SMMR/SSMI, and so the practical record begins in late 1978 with the launch of NASA’s Scanning Multichannel Microwave Radiometer (SMMR) satellite., and continues with the Special Sensor Microwave/Imager (SSMI). Advanced Microwave Scanning Radiometer (AMSR) and Cryosat-2. “observations show more Arctic sea ice loss than the climate models average.” Fortunately, sea ice loss stopped since 2007, with a plateau appearing whether you look at September minimums or annual averages. The predicted 2013 and 2016 Arctic meltdowns did not happen. Arctic ice is a self-oscillating system driven mainly by the e Ws: Water, Wind and Weather (the latter meaning storms and intrusions of southern air). What CO2 has to do with Arctic ice extent is a matter of conjecture. But note “than the climate model’s average”. That average could be anything, as the climate models vary hugely. And why the average matters is unclear. There’s nothing special about the average. 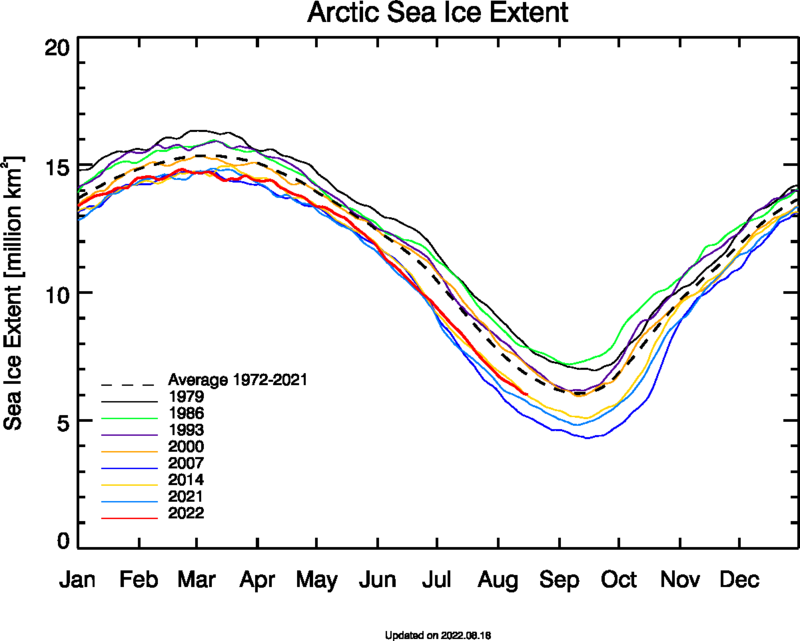 We have had plenty of forecasts of an ice-free Arctic and they have not been remotely accurate. Thank you for creating your website. I found it most informative and was able to use it to get me to a link of daily sea ice. Like you I view the plateau since 2007 has a refutation of IPCC projections. It’s a shame more people don’t read Einstein because then the world might recognize a theory that has been disproven. No mention of geological seafloor heat flow? i.e. the fact that the Arctic sits on top of molten rock. Nah. Gotta keep that CO2 narrative going. Weren’t we told that the Arctic would be ice free by now? In the late 2000s, Al Gore made a series of high-profile statements suggesting the possibility that Arctic sea ice could be completely gone during the summer by around 2013 or 2014. Yes, December, 2008 at a lecture in Germany, he said that Arctic ice would be gone in 5 years. The only part that we can know is unprecedented is tha now we have satellite measurements. There has been no downward trend in Arctic ice volume or extent for over 12 years. Could this be an effect or echo of the “Pause”? Be tough to “Karlize”. Just programme it to say what you want to believe in, add a colourful graph and Volla we have scientific facts. simpler models is what they did. All science is models. That’s not the point. Science is the residue of models that have failed to be shown wrong, that’s all. Except climate science of course – that’s all models that have either been shown to be wrong or are incapable of being proved wrong. Articles of faith. Metaphysics. There’s models and there’s models. Darwin’s model of evolution was not hundreds of models run tens of times, each one producing a different result. Can we all agree that 37 yearz in geological time not hardly even a portion of a blink! My god! Can we move past this already!…ummm nope cuz we need to tax people…on bs. We currently aren’t that far behind the “average ” line in the Arctic sea ice extent graph, although we are in transition at this point in the season and the gaps year to year are smaller. The Arctic air temps have been somewhat above “normal” but that is about to change as the Euro is predicting the jet to flatten keeping the cold bottled up above 80N in the next couple of weeks. This might actually freeze a lot of the water and the ice extent will grow faster. Be interesting to see how it goes this winter. NASA improperly using an “average” to describe a cycle. Assuring NASA of misinforming virtually everyone. The Arctic Sea is covered with ice, summer and winter. STOP repeating the lies of the human hating f*cks. Just cut it the f*ck out! CO2 forcing has almost nothing to do with Arctic Sea Ice Extents. Arctic Sea Ice Extents follow 30-year PDO, AMO and NAO ocean cycle, which is why there has been no statitistically signicant decreasing trend since the PDO ended its 30-year warm cycle in 2008. Since 2008, there have been a few one-off events like the 2012 Super Cyclone (strongest and longest in 50 years) and the 2015/16 Super El Niño, but even with these events, Arctic Sea Ice Extents have been relatively stable. When the PDO, AMO and NAO are all in their respective 30-year cool cycles from early 2020’s , Arctic Sea Ice Extents will begin to gradually recover back to 1980 levels. 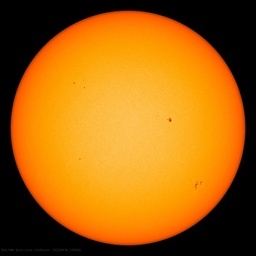 There will also be a Grand Solar Minimum event starting from 2021, which will likely add to global cooling and contribute to Arctic Ice Extent recovery. In about 4 years, CAGW advocates will have a very difficult time explaining why Arctic Ice Extents and Greenland Land Ice Mass are recovering, and why a global cooling trend is developing, despite 30%+ of all CO2 emissions since 1750 being made over just the last 25 years.. I would wager that it is not at all due to human-emitted carbon dioxide. There is a case for human produced soot having a very minor contribution. But CO2, there is absolutely no logical scientific mechanism that could cause CO2 to melt Arctic sea ice.. There is something really simple about the model ensemble graphs, the spaghetti chart, that I don’t understand. Maybe someone could help? Why does anyone think, if they do, that the average of a bunch of failing and succeeding models is of any value? Why do they not just use the ones that have succeeded and junk the failing ones? Why is the emphasis apparently not on getting and using good models, but on continuing to use the ones proven to have failed? And why does anyone think that just because a couple of models at the very bottom of the huge range of FAILURES go somewhere near reality, they actually represent reality, rather than just blind luck. ! Because then some of the Pals would lose their funding. Can’t have that. There appear to be 3 features of INMCM4 that differentiate it from the others. Thanks for this. I guess it is a real if unacknowleged issue. I had hoped to get the pro argument from someone like Nick Stokes, but maybe there simply isn’t one. It seems like an enormous logical howler, its hard to believe I am the only one to be puzzled if so. Is that a surprise for anyone? The coolest year in a 60 Years cycle. is it worth reading any more? An internal oscillation has been identified in the degree of acknowledgment by the scientific community of natural climatic cycles. Periods during which climate oscillation is acknowledged alternate with periods during which it is denied, or not mentioned. Here we find that oscillation in the climate itself periodically forces the fluctuation in acknowledgment of those cycles. When climatic oscillation is in a cooling phase, there is a distinct step-up in acknowledgment of and research into the role of natural internal variability in scientific publications and communications. Conversely, when the same climate oscillation turns to a warming phase, silence abruptly descends on the topic of natural climate variability and climate cycles are denied. Since this periodically forced oscillation in the profile and acknowledgment of climate variability is drive by alternating phases of positive feedback in opposite directions, this leads to a simple monotonic oscillation and a relationship of strong nonlinear periodic forcing, between the phase of natural climate variation, and the willingness of climate scientists to acknowledge and focus research effort on those same cycles. Arctic sea ice loss in the last 37 years is due to AMO alone. tell it to the Russians and Mersk. Both are aiming to make millions on shipping from-to China and points East. “40 to 50 percent”: sure, why not? that leaves 50 to 60 percent due to human causes; quite significant. “green tech” kills jobs, so we see what your agenda is.